use to be it wasn’t as bad as it is now . spring and fall was usually windy but now it seems to blow even during stable weather. our winters have become very windy making the cold feel even worse. rare we have a calm day nowadays. Newest 12z gfs run now is almost all rain here and it looks to have brought the low further north. I’m guessing 6 inches of snow is slipping out of range for this area. Probably still see snow, but i doubt much sticks…maybe when the wraparound band moves thru overnight Friday. Heaviest snows being seen in W MN and E South Dakota. Denver should be right around 80F today…tomorrow night it should be snowing and 25F. I doubt a lot of these totals but who knows. 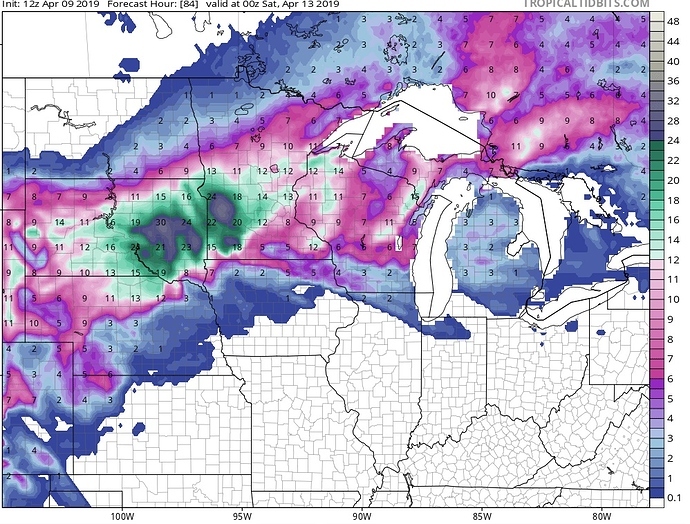 I guess if the heaviest falls overnight, then more apt to be snow. Lots of moisture. 80F today, 20F tomorrow in Denver. Fortunately both the peaches and apricots are still asleep…they are late this year! after last nights 6in , 167in.of snow, now the 3rd. snowiest on record. more tonight. if we get 13 more inches this season , we will be 2nd snowiest. they are 2 zones s. of me. unusual for them but not unheard of. I’ve seen 2ft. in 2 days in mid april. sometimes smaller amounts up until mid may. We’ve had some gorgeous upper 50s and mid 60s days with sunshine, but it has switched over to rain with snow coming back tonight. They say but hopefully are wrong about a 60 Degree drop in 36 hours with maybe 6" of snow but atleast 12 hours of under freezing temps hitting 24 by tomorrow. Wet feet wading in the goldfish pond today……………beautiful weather in Kentucky. Gotta let my blood thin out again before it gets hot. That would be an excuse for sassafras tea. I’ve been blaming it on the logging companies. Yeah, you never can tell what the weather will be since they started usin’ them bows and arrows. Seems 13-23" is the consensus prediction by the 3 weather sites I use. Travel tomorrow will likely be about impossible. I won’t be surprised if our township doesn’t spend the money to plow. Just wait for it to melt? Yeah that sounds like a mess. Showing about an inch and a half of rain here…a cold miseable rain.